Stand up paddle boarding (SUP) is one of the fastest growing outdoor recreation activities in America. In response to this popular trend, 4-H camping programs have added this option to their recreation portfolios. 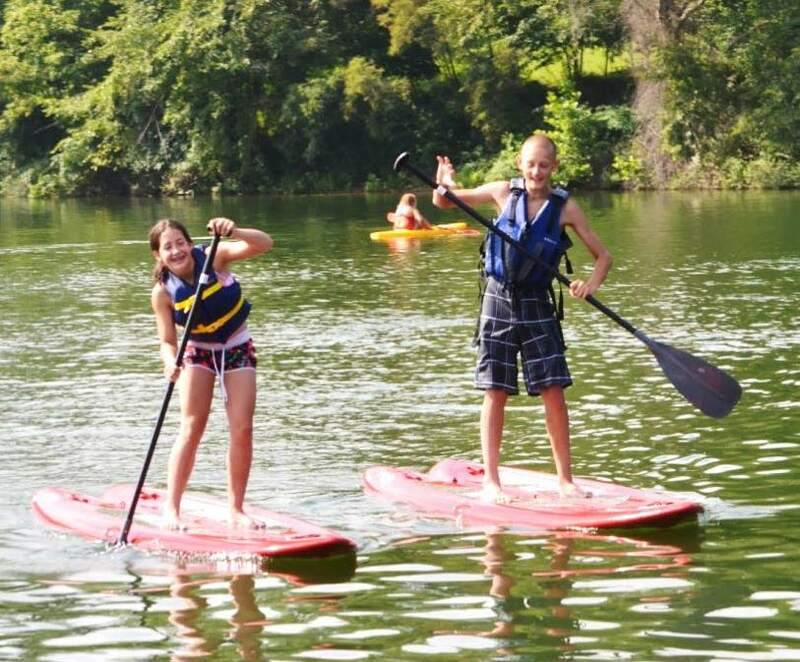 Due to a shortage of certified SUP instructors, most 4-H camps are teaching SUP with lesser-qualified instructors. This presents concerns about participant safety, quality of learning, and user enjoyment. This fact sheet provides a stop-gap training option for creatively engaging participants in 4-H SUP instruction. Developed in native cultures worldwide for fishing and traveling, recreational SUP migrated to the contiguous United States from Hawaii in 2004. It rapidly expanded due to its (relatively) low input cost and ease of participation. Pictured at the right, SUP is similar to other paddle sports (e.g., kayaking, canoeing) but in a stand-up position. Participants use a long paddle and stand on a flat board, which is generally 10 feet or more in length. SUP participants can enjoy everything from a rigorous core workout to a lazy meander on flatwater. Why do youth enjoy SUP? Research suggests that youth enjoy recreation activities which are safe, fun, and challenging, yet easy to master. SUP offers all three! Experience suggests youth participants also enjoy the quick freedom of movement afforded by such a nimble craft as well as the opportunity to be inches from the water. The occasional act of piracy also seems to play a role! All participants should have on proper attire. Minimally this means a good fitting swimsuit and personal flotation device (PFD). The nimble board action and ease of mastery make stand up paddle boarding an ideal positive youth development activity. Above, two youth socialize while racing across the lake. As the instructor, make sure you are properly dressed. This generally includes modest swim attire, skin protection, sunglasses, and a properly fitting PFD. Industry standards suggest no more than a 1:5 instructor to camper ratio, so bring along a trained assistant or staff person for larger groups. Depending on your physical location, it may be beneficial to bring the SUP equipment near the shore prior to camper arrival. To ensure campers get on the water efficiently, “speed without hurrying” through this section. Start by properly fitting a PFD for each camper. Any PFD rising above the ear lobes when pulled up from the collar needs a readjustment for a better fit. Once everyone is fitted, provide each camper with a SUP paddle. Most paddles have telescoping adjustments, so fit the paddle to a height that is approximately 10 inches taller than the camper. Grip/hold. The inside hand on top of the ‘T’ and outside hand holding comfortably near the midpoint of the shaft. Forward stroke motion. With the convex portion of the paddle facing the front of the imaginary board, the campers will bend their knees and pull back alongside their bodies. Have them practice going back and forth from one side of the board to the other so they learn to efficiently adjust their hands for each stroke. Turning and stopping. Instead of pulling back alongside their bodies, they will paddle a wider arc several times on one side to make a turn. To stop, they merely need to stab the paddle into the “water” and gently push forward once along each side of the board. Mind your paddle! Most paddles sink after 15 seconds. Teach campers that the first consideration after falling in the water is safety followed by securing the paddle. To view videos of these actions, refer to Mountaineers Books (2011). One at a time, release the campers to the open water. Through mini-races and directional challenges, test all five items covered in the On Shore section. If campers are comfortable, this includes falling one-at-a-time into the water to practice group assistance and safety signaling. After some free navigation time, have them draw close and stow their paddles for some creative challenges! Yoga Poses—boat; tree; warrior; crow. For additional yoga poses, consult Washburn, Copeland, and Vincent, 2014. Exercise Challenges—jumping jacks; sit down stand up; turn arounds; jogging in place. Board Balancing—see who can walk furthest to the front of their board without falling in; then to the back. Team Planking—use two side-adjoined boards with feet on one board and elbows/arms on the other to see which pair lasts the longest. Returning to shore is the most dangerous component of a SUP class. Newly self-minted SUP experts try to show off their skills and forget to (a) return to their knees 25 feet away from shore, and (b) stay out of the water once they have docked. Rely on your assistant(s) to manage this chaotic process accordingly. Also remember to have them put up their fins while still out on the open water. Once campers experience paddle boarding for multiple years, any free navigation time often devolves into piracy. What is piracy? Simply stated, campers leave their boards to play “man overboard,” relax on the board of a neighboring camper, or steal away the board of another camper. There are inherent risks to piracy, but they can be managed by adept instructors with sufficient lifeguard support. Beware that lost paddles or teeth may occur with insufficient management! Piracy is not recommended for novice participant groups, poor swimmers, choppy wave conditions, or groups for which bullying is a concern. Blakeney, J. (2012). Stand up paddling: An essential guide [DVD]. Beachburg, ON: Heliconia Press. Casey, R. (2011). Stand up paddling: Flatwater to surf and rivers. Seattle, WA: Mountaineers Books. Mountaineers Books (2011, May). SUP Lesson #2—Paddle Strokes. Retrieved from youtube.com/watch?v=Y3CsyKRAj8E. Washburn, L., Copeland, L., & Vincent, J. (2014). Yoga for kids: A 4-H Healthy Living Program. University of Arkansas Division of Agriculture, Cooperative Extension Service.